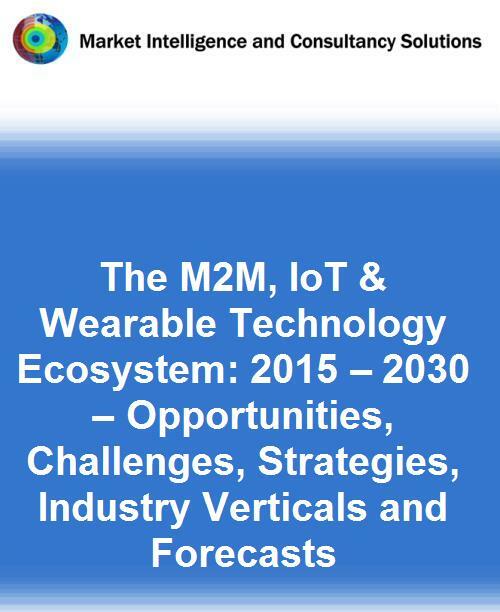 DUBLIN, IRELAND --(Marketwired - April 04, 2016) - Research and Markets has announced the addition of SNS Research's new report "The M2M, IoT & Wearable Technology Ecosystem: 2015 - 2030 - Opportunities, Challenges, Strategies, Industry Verticals and Forecasts" to their offering. The report forecasts that M2M and wearable devices can help IoT service providers pocket as much as $231 Billion in service revenue by the end of 2020, following a CAGR of 40% between 2015 and 2020. Eyeing opportunities to route huge volumes of traffic from these wearable devices, many service providers are now seeking to fit wearable technology with their M2M offerings, targeting both consumer and vertical markets. Mobile device OEMs are aggressively investing in wearable devices, in order to offset declining margins in their traditional smartphone and tablet markets. As a result, the market has been flooded with a variety of smart bands, smart watches and other wearable devices capable of collecting, sending and processing data over mobile applications. M2M, IoT and wearable technology ecosystem. Enabling technologies and key trends. Network architecture and mobile operator business models. Applications, opportunities and deployment case studies for a range of vertical markets including automotive & transportation, asset management & logistics, consumer, energy & utilities, healthcare, home automation, intelligent buildings & infrastructure, military, professional sports, public safety & security, retail and hospitality. Regulatory landscape, collaborative initiatives and standardization. Industry roadmap and value chain assessment. Profiles and strategies of over 600 leading ecosystem players including enabling technology providers, wearable/M2M device OEMs, mobile operators, MVNOs, aggregators, IoT platform providers, system integrators and vertical market specialists. Strategic recommendations for ecosystem players. Market analysis and forecasts from 2015 till 2030.